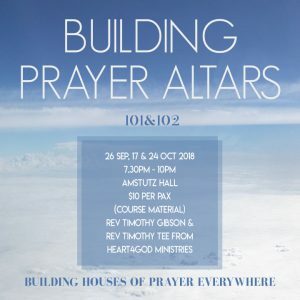 ‘Building Prayer Altars’ is not just a good idea but it is an indispensable strategy for a God-filled life. This is not just another programme but a path that will bring you back to a Christian way of life that is biblical, faith-filled, Spirit-led and victorious. The objective of the course is to draw you to God’s altar to renew your personal covenant with Him. You will be transformed by God who will empower you to testify of His goodness to others. Please register at the information counter. Please contact Ho Ai Choo @ 9298 6767 for enquiries.